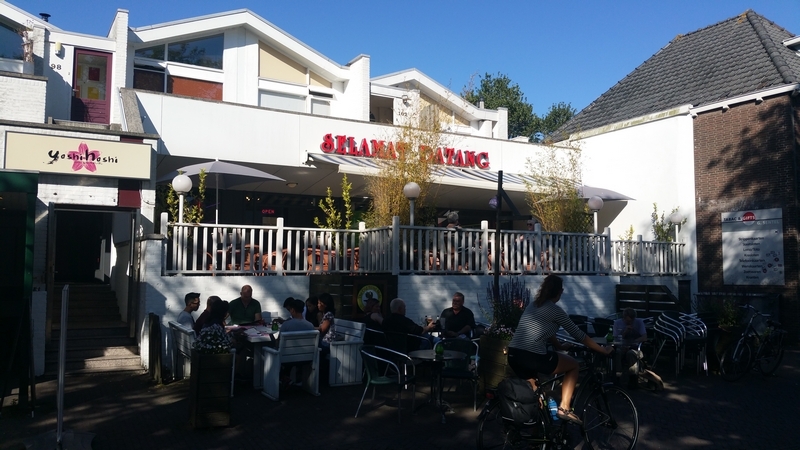 Restaurant review #119 – Selamat Datang is an Indonesian restaurant in the center of Zoetermeer, a small town north of Rotterdam (NL). We’ve visisted Zoetermeer quite a few times over the year for a music show, as there is a music venue that hosts a lot of prog rock bands and tribute bands: De Boerderij. 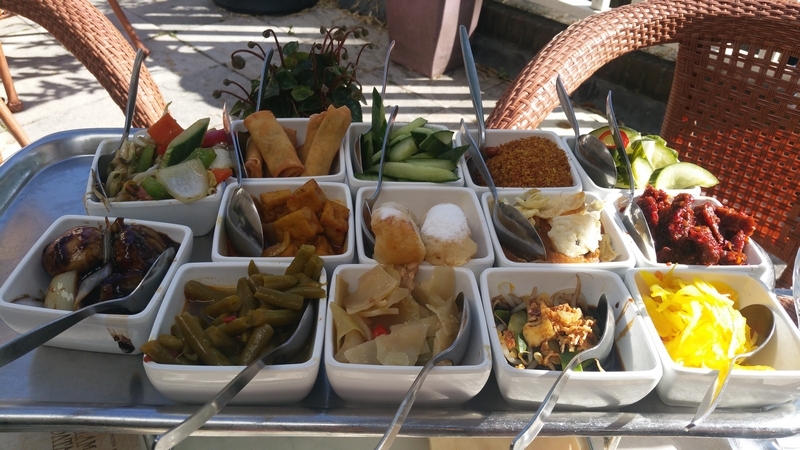 There are plenty of Indonesian restaurants in The Netherlands (given the historical link with the country), but unfortunately they are a rarity in Belgium. 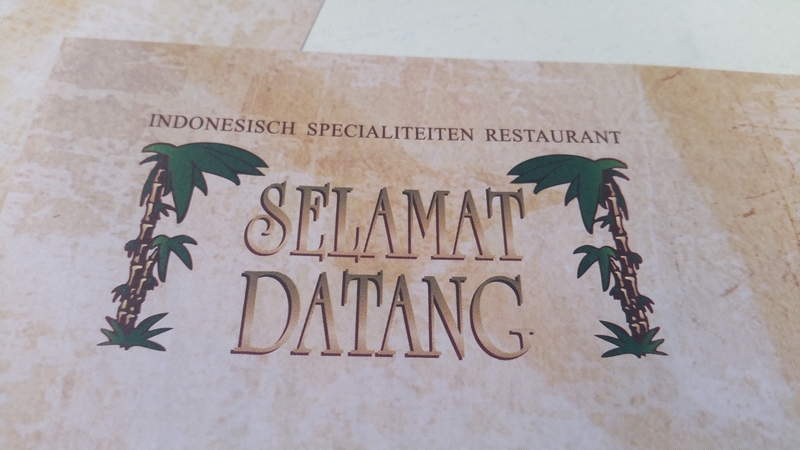 So whenever we are in the Netherlands, we try to go to an Indonesian restaurant. We had been to Selamat Datang one time before, a couple of years ago, and I recall we had no trouble being served a vegan meal then (we only took a main dish each at that visit). 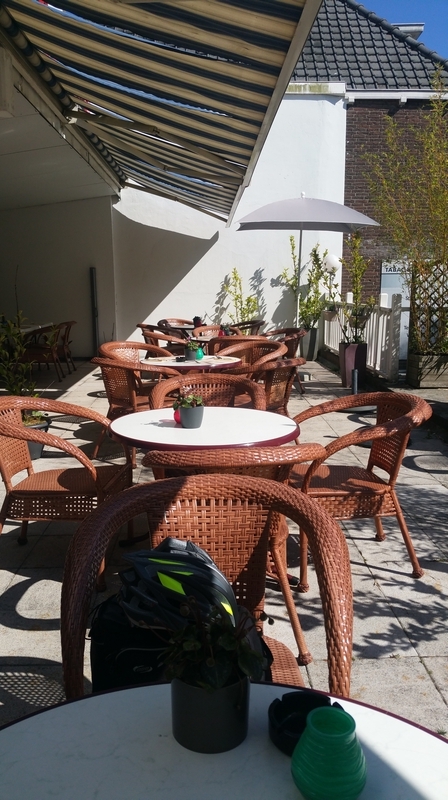 It was a very hot Spring day, and we sat on the outside terrace (the restaurant is on the first floor, and the terrace in front, viewing passage in the street). 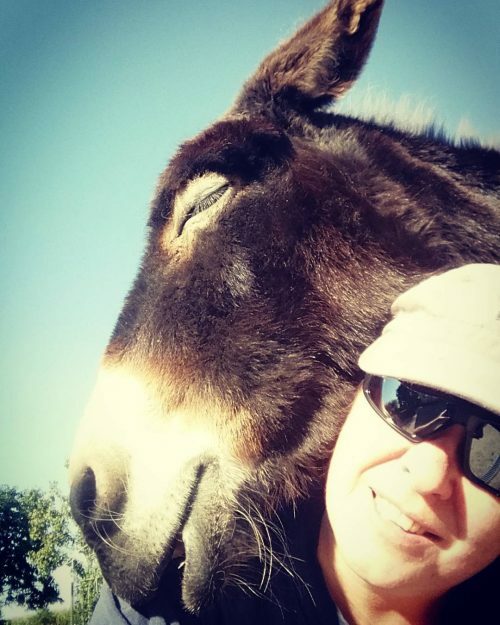 At first glance, there doesn’t seem to be anything vegan on the menu. 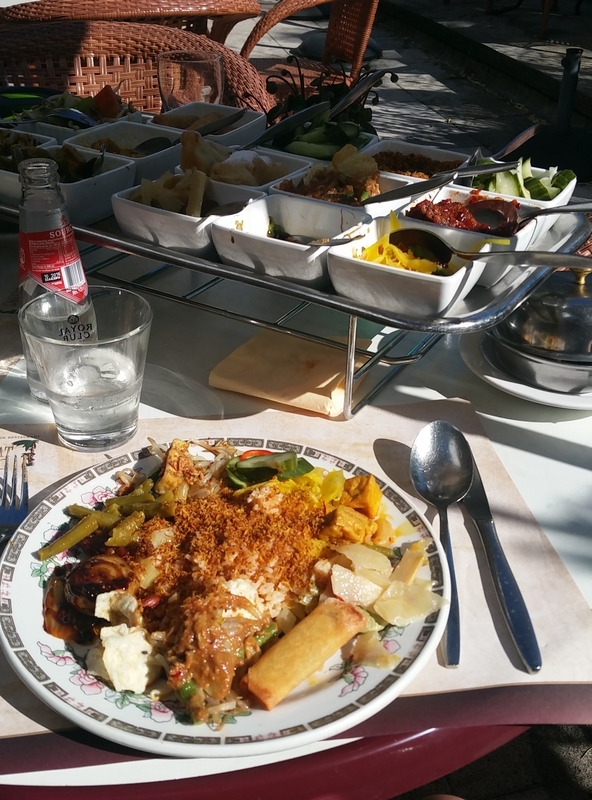 We asked the waitress whether we could get a vegan rice table (which is fairly common in Indonesian restaurants). We had a little trouble communicating, as she didn’t seem to understand Dutch very well. We got a bit anxious after having spelled out no animals, no eggs, no milk in various ways and languages, she replied, and fish? But eventually it seemed to sink in. This is what we we were served. 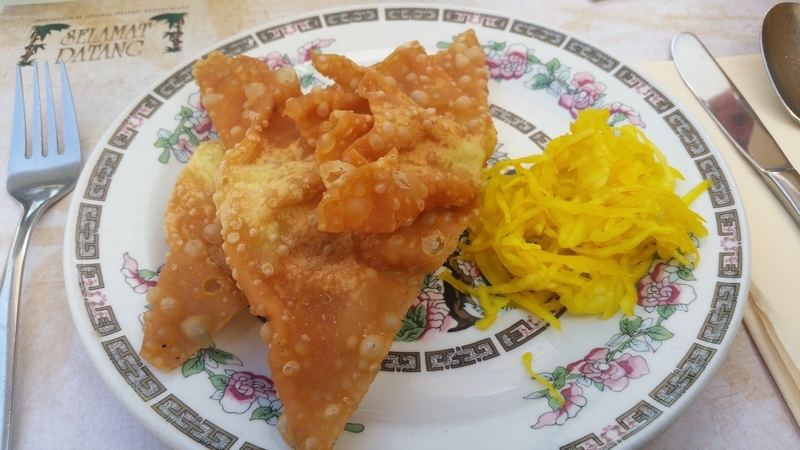 As an appetizer we had a fried piece (it was said to be fried dough with vegetables) and atjar (sweet sour vegetables). Nice, but very greasy. 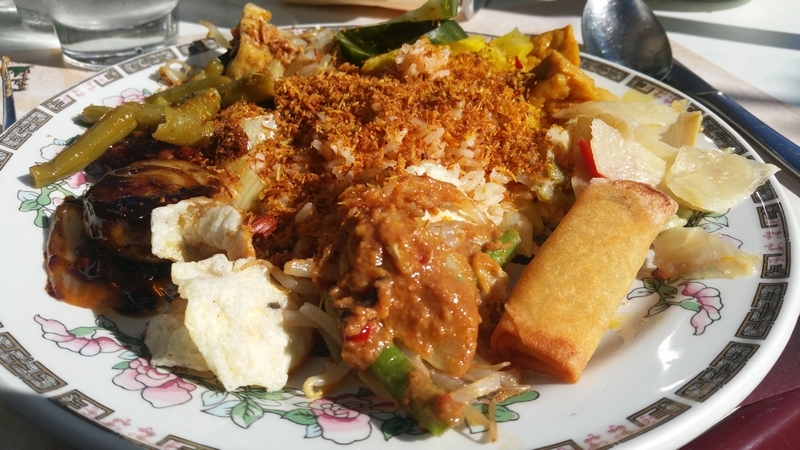 The rice table included the usual suspects like gado gado, emping, ground peanuts, spicy tempeh, dish with tofu, atjar, sweet baked banana, etc. A great variety, and it was delicious! The food was 22,75€ per person. Bami and nasi were 1,75€ each. Small bottle of sparkling water was 2,50€. Chairs outside were comfortable (with armrests!). Selamat Datang also offers take away, and there were several people coming in and out to take dinner home. Toilets are in the back (forgot to take a pic) and were tidy. 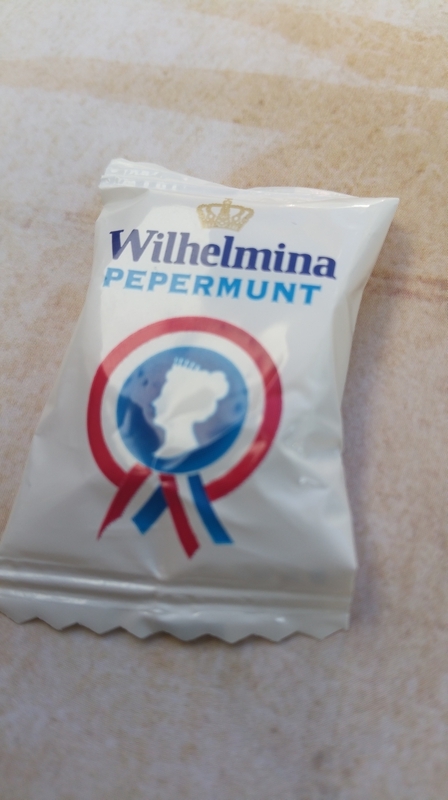 With the bill came this peppermint which is quite popular in the Netherlands. Just a heads up that it’s not vegan (contains gelatine). Oh and the show of Riverside (a Polish prog rock metal band) that evening in De Boerderij was great! A fabulous evening. See some clips of the concert on my IG here and here.